For more information on what’s included in the collection check the brochure provided in the link above or contact Nina Scholtz (nes78@cornell.edu), Digital Resources Librarian. New in HeinO nline, the Selden Society Publications and the History of Early English Law contains searchable digital images of the entire series of Selden Society publications and Ames Foundations publications, as well as other useful materials on English legal history, all searchable in one location. The Selden Society Annual Series includes scholarly editions of essential common-law source materials back to the Middle Ages. Publications of the Ames Foundation include modern scholarly editions of the Year Books to Richard II (1377-1399) in the original languages and translated into modern English and other sources of early English legal history. If you have questions about our new databases, please contact Nina Scholtz (nes78@cornell.edu), Digital Resources Librarian. The library has recently acquired the EBSCOhost database Criminal Justice Abstracts with Full Text. The database features close to 500,000 records from the most influential publications in the discipline, including full text for nearly 300 journals and magazines, according to the publisher. The database may be used by all Cornell students, faculty, and staff both on and off campus with the link given above. The law library has a new resource available designed to help researchers navigate international legislation and case law regarding the acquisition and ownership of artwork. Art Law & Cultural Property from the International Foundation for Art Research contains resources and information covering legislation that governs the export and ownership of cultural property from dozens of countries with primarily a European focus. Additionally, it covers case law and hard-to-find out of court settlement documents pertaining to art ownership issues in the United States. The database is available to all Cornell students, faculty, and staff both on and off campus with the link given above. 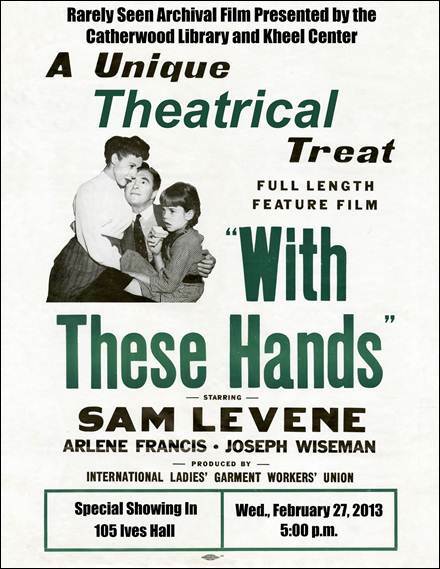 In 1950, the International Ladies’ Garment Workers’ Union (ILGWU) sponsored a documentary, With These Hands, to celebrate its first fifty years. 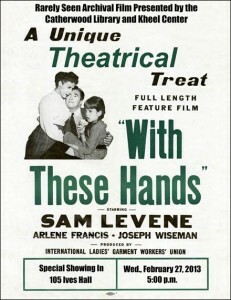 While previous labor films had not been successful, With These Hands used Hollywood professionals—the director was Jack Arnold, who would go on to direct 1950s cult classics such as Creature from the Black Lagoon and television episodes of popular shows—and was much more popular with audiences. Ultimately, it was nominated for the Best Documentary Oscar in 1951. Tonight, the Catherwood Library and the Kheel Center, part of the Cornell ILR School, are sponsoring the first public showing of With These Hands in almost fifty years. The film will screen at 5:00 pm in 105 Ives Hall. For more information about the film and its history, see the Kheel Center’s February 22 announcement, with a bibliography of archival materials in Kheel Center collections, written and compiled by Katie Dowgiewicz, ILGWU Project Archivist. We’ve just acquired a new book that should be of interest to many of our students. In Chambers: A Guide for Judicial Clerks and Externs by Jennifer L. Sheppard, Associate Professor of Law, Mercer University, is now available on reserve in the Law Library Reading Room (ask at the circulation desk during normal library hours). Professor Sheppard offers guidance on everything from attire to court organization and process to drafting an opinion. A sample bench memorandum is included, as are chapters on standards of review and drafting jury instructions. Students looking ahead to obtaining a clerkship will also find the book useful, as it includes a chapter explaining the application process as well as sample resumes and cover letters. While this book may be used only in the Reading Room, other books on this topic are available for checkout. Search our library catalog for the subject heading “law clerks United States”. We also have Law Clerk Handbook: A Handbook for Law Clerks to Federal Judges, edited by Sylvan A. Sobel, available online through HeinOnline. Cornell law students interested in speaking with a reference librarian about legal research for an upcoming externship or clerkship may request a research consultation at the circulation desk. We have two new Hein databases available for use by all Cornell faculty, students, and staff. This database includes reports, decisions, and records of several of the most important federal agencies, including the Federal Communications Commission (FCC), the National Labor Relations Board (NLRB), and the Securities and Exchange Commission (SEC). Complete collections of case reports from these and other agencies are included. 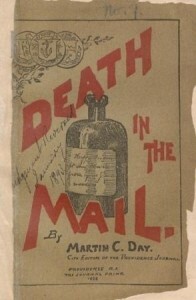 The documents are images of the originals. This database includes the entirety of Cheryl Nyberg and Carol Boast Robertson’s Subject Compilations Bibliography Series, previously available at Cornell Law Library in print only. Users can now search the full text and link directly to articles in HeinOnline and many freely available web resources. The database also includes many other multistate surveys of law. If you have any questions about using these databases, please contact Cornell Law Library Reference. For information about other new databases at Cornell Law Library, see Update on law library databases.